My dog has an instinctive ability for locating places within homes that offer ‘prospect’ and ‘refuge’ she likes to shelter under a set of stairs at my brother’s beach house where she can see out a vantage point which allows her to easily spot perceived danger which simultaneously allows her to have a guarded back securely against solid block work fortress of a wall so nothing can sneak up behind her. As humans we are less blatant about seeking out these spaces of refuge, it is most obvious and easily observed in places where people are less inhibited such as cafes and bars where the booths and built in furniture areas are quickly filled or reserved- they offer intimate areas of protection, but also at the same time the polemic aspect of feeling connected to the room instantaneously and being able to observe the space from a safe distance. The idea of replicating or perhaps re-imagining these kind of spaces of prospect/ refuge in our own homes whether blatant or subconsciously can be clearly witnessed in areas such as: snuggeries, nooks boudoirs, bay windows and lounge rooms , a bay window nook is the perfect addition to a sunshine coast beach house design where one can curl up with a book and stare out towards the sea, bodies of water are notoriously comforting aspects. The principals of ‘Prospect’ and ‘Refuge’ are notions coined in 1975 by Jay Appleton in his book ‘The experience of landscape’ and popularised by Grant Hildebrand in his book ‘Origins of Architectural Pleasure’ in which he attempts to understand the reasons behind the acclaimed success of residential projects by architects such as Jorn Utzon and Frank Lloyd Wright. The basic principals of ‘Prospect and Refuge’ are based on the Darwinian notion of ‘survival of species’ the idea that in order for any creature to survive or indeed prosper in an environment is the ability to engage in a meaningful connection with a space and also the combined proximity to seek out safety or comfort either perceived or actual. ‘Prospect’ in our case refers to being able to connect with the surroundings, visual amenity, gaining an outlook or vista. ‘Refuge’ on the other hand refers to the ability to retreat, escape or withdraw, finding comfort in the ability to seek out more private, protective or intimate spaces. 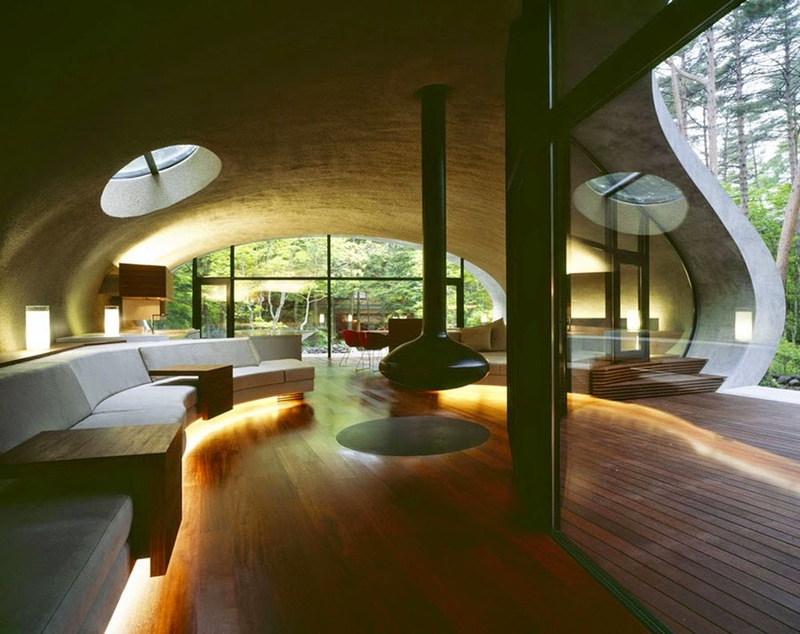 Both Appleton & Hildebrand respectively offer the example of a cave looking out into a wooded area as the perfect metaphor for the concept of a space containing both prospect and refuge -a snug protective area looking beyond towards picturesque scenery, both of which are elements you should endeavour to replicate in your home design. Another seminal figure who offers a seemingly analogous view of this theory is Maslow who’s ‘hierarchy of needs’ pyramid famous throughout 1st year marketing courses at university states that first and foremost the most importance aspect of life to humans is the ability to find safety & shelter. Hildebrand offers Jorn Utzon’s home in Majorca Spain as a perfect exemplar of a place that offers both shelter, safety, prospect and refuge it is a solid masonry block work cavernous building, which faces the ocean, the rear of the room is dark seemingly without windows a very sturdy cave-like space but with comfortable furnishings it faces the azure blue waters of the Mediterranean Sea and is bright and sunny outside, the room is an intimate space with a low flat ceiling and sparsely adorned walls and floors the openings which penetrate the walls and offer glimpses of the sea expose the thickness of the walls, they are twice as thick as you would expect in a regular house and this along with the intimate height of the ceiling combines to give one psychological feelings of comfort and containment. Hildebrand offers another architectural precedent of a place which embodies the essence of prospects & refuge, he offers the arched courtyards of the Spanish Alhambra as another perfect exemplary shade structure that provides the same kinds of psychological protection and feelings of comfort as Utzon’s villa and a cave. Appleton , J., 1975. The experience of landscape. New York : John Wiley and Sons. Experiencing Architecture, 2010. 5 Basic Human Concerns in Architecture. [Online] Available at: https://experiencingarchitecture.com/2010/02/23/5-basic-human-concerns-in-architecture/ [Accessed 28 July 2016]. Hildebrand, G., 1999. Origins of Architectural Pleasure. Berkeley: University of California Press. Maslow, A.H., 1970. Motivation and Personality. New York: Harper and Row.